Having been pretty serious about watering the garden every day – and that it rained buckets for a couple of days – the back yard veggie garden is looking pretty darned good this week. The beans have pretty well covered the tipi of poles arranged for their climbing convenience, and the bush beans have so far been somewhat productive. I have several batches of them going, having started them at different times since March 1. The tomatoes go up – or hang down in fairly impenetrable thickets, and we have this very week harvested the first couple of handfuls of cherry and tiny yellow pear tomatoes. The resident rat has nibbled at one or two ... but I think that putting out the trap for him will put and end to that nonsense within a couple of days ... before the seriously large heirlooms ripen. Even so, the tomatoes in the larger hanging planters are covered with grape-sized green fruit, and the tomato plants in the raised beds of hardware cloth or chicken wire are doubled that, so the rat will have to be the size of a cocker spaniel in order to make much of a dent in them ... but it's still the principle of the thing. I didn't spend more than $50 at Rainbow Gardens and about the same at Lowe's for a nasty furry rodent freeloader to come along and help himself. He's already helping himself to some of the pepper plant and eggplant leaves, too – biting them clean through the stems – and last week the most nearly ripe yellow banana pepper was eaten, every scrap but the stem. I had plans for that banana pepper, too. Think of the rat as a walking dead rat. This year I took a chance on a couple of tomatillo plants – which have grown to near-shrub size, and adorned with little green balloon-like tomatillo husks ... but as of yet, no evidence of tomatillos. Likewise with the bed of squash; two sorts, the round green patty-pan sort, and some kind of Lebanese zucchini variant. The plants are huge and sprawling, with some flower buds on them, under the leaves. I did send away from some specialty seeds for French gherkins, so that I can make proper cornichon pickles. 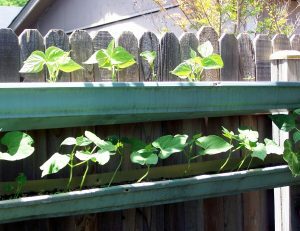 It worked out to about .17 cents per seed, for a teeny packet of about twenty seeds – but they have also burgeoned to the point of climbing energetically their own tipi-arrangement. Note to self – save one of the resulting gherkins and allow to go to seed ... for next year, of course. The frost-killed shrubs that were planted originally to attract humming-birds have come roaring back as well. 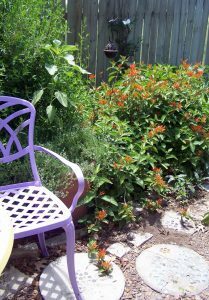 The back garden looks so very pleasant now – after the barren wasteland that it was in January and February – that I was moved to bring home some cans of pastel spray paint and re-do the café table and chairs in colors that matched the house, or trim and some of the pavers. The café set was a bargain from Big Lots, bought these many moons ago because they were attractive, sturdy and relatively cheap, but the colonial red I had painted them then had gotten faded and began to chip. 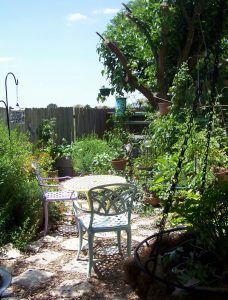 Really, I think my next project will be to reclaim the back porch as a pleasant place to sit and view my garden bounty. And did I mention the apple tree? Yes, I found an apple tree – but now I have to plant another one, so they can pollinate each other.